The delay of Steam Machines and their Linux-based SteamOS has not halted the launch of other PC-turned-consoles. PC builders all seem to have a dedicated section for custom living room PCs and Alienware’s been showing off the Alienware Alpha, which is essentially a Windows version of a Steam Machine. 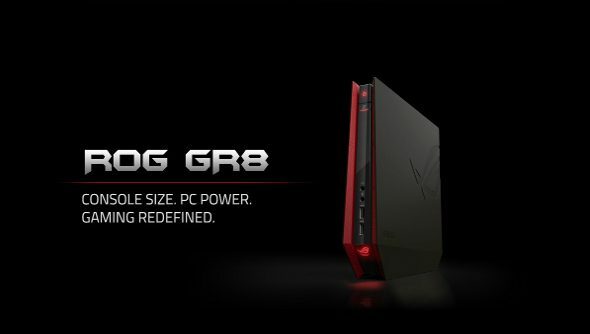 Now ASUS is trying to get a slice of the action and recently announced with the GR8 Console PC. It’s about the size of a Wii, is less than 3 litres in volume and can be upgraded ever so slighty. The tiny machine is powered by a dual-core Intel Core i7-4510U (2 GHz) processor and an Nvidia GTX 750Ti GPU. It’s stuck with the CPU and GPU, but the DDR3 RAM can be upgraded to 16GB while storage can be increased as well, as removing the cover reveals a slot for a 2.5” hard drive or SSD. It’s obviously not for anyone planning on upgrading to stay ahead of the curve. Or even slightly behind it. It won’t be cheap either, expected to be as pricey as $999, which is not insignificant given its middling power. And it seems a bit too much if it’s going to tempt console gamers into getting a PC for their living room.